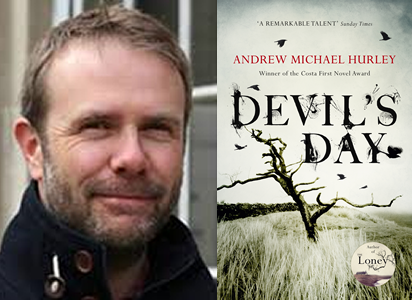 Join us for an evening with Andrew Michael Hurley, author of the award-winning bestseller The Loney. as he talks about his second novel, Devil’s Day. All stories in the valley have to begin with the Devil . . .
After the blizzard of 1913, it was weeks before anyone got in or out. By that time, what had happened there, what the Devil had done, was already fable. Devil’s Day is a day for children now, of course. A tradition it’s easy to mock, from the outside. But it’s important to remember why we do what we do. It’s important to know what our grandfathers have passed down to us.Because it’s hard to understand, if you’re not from the valley, how this place is in your blood. That’s why I came back, with Kat, and not just because the Gaffer was dead.Though that year we may have let the Devil in after all . . The Loney, Andrew’s first novel was first published in October 2014 by Tartarus Press, a tiny independent publisher based in Yorkshire, as a 300-copy limited-edition. before being republished by John Murray. It went on to sell in twenty languages, win the Costa Best First Novel Award and Book of the Year at the British Book Industry Awards in 2016, and is in development as a feature film. Tickets: £5 (redeemable against a signed copy of Devil’s Day). Includes a glass of wine / soft drink on arrival. Tickets available from the bookshop, or purchase online (with booking fee).